Product information "HAIX Athletic Socks"
The HAIX Athletic sock - a sock, which makes an outstanding figure in every Sneaker, regardless of the fact that the sock was made for one specific shoe. The high quality is based on the fact that they have been designed for the Black Eagle, a shoe that has to deliver maximum performance in every situation. The HAIX Athletic sock is suitable for both professional and leisure use, it plays its full strength whenever absolute top performance is required. The material mix of Merino wool and a synthetic fiber blend ensures that the socks are comfortable to wear even at high temperatures. The moisture is absorbed very well and the climate inside the shoe stays pleasant. For this reason, these socks are very popular with long-distance skiers, which are always to be found where man and material reach their limits. As running socks they are absolutely top of their class, but they are also perfect for other kinds of sport. They are perfect sport socks, thanks to their moisture-absorbing properties and their excellent fit. Especially in the summer, their short cut is a very pleasant enrichment for riding a racing- or mountain bicycle. Because of their classic unisex look, the sport socks are also suitable for women. So they should not be reserved for men only. Sport is certainly a gameplay for the skills of the HAIX Athletic socks, but also at work, they are a bank when it comes to true top performances. The sock was originally designed for the Black Eagle, a shoe that can be used whenever the duty is demanding and man and material are being tested. Therefore the socks are suitable for both, outside work during summer and working indoors. The short socks are always to be found when the temperatures are as high as the requirements of the application. HAIX Athletic sock. The ankle-high sock, specially developed for the HAIX Black Eagle, offers additional protection thanks to the raised heel and ensures a comfortable entry. The high-quality Merino wool and synthetic fiber blend is quick drying. Flat toe seams optimize the perfect fit. 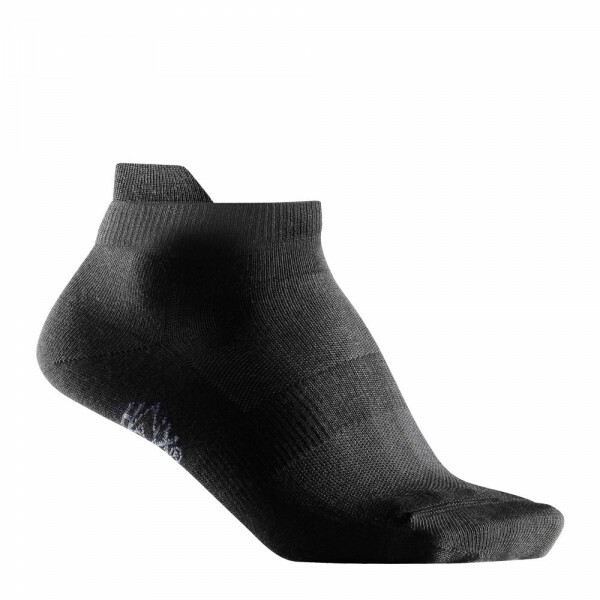 HAIX® Athletic Socks support vapor transportation through a combination of synthetic and natural fibres. Rubber-free seams to avoid pressure points. Rib-knitting guarantees a perfect fit. Natural fibres next to the skin absorb humidity. Soft and strong sole.